Jenny Keller, creator ofJennyCookies.com and baker to the stars, is best known for her amazing dessert tables she makes for celebrity parties. With this cookbook you'll be able to bring the party home, but don't tell anyone it started from a box. With chapters dedicated to baby showers, weddings, holidays and all kinds of themed parties, you'll have a dessert ready to please any crowd. And since you don't have to start from scratch, you'll have time to enjoy yourself at the gathering instead of spending all your time in the kitchen. 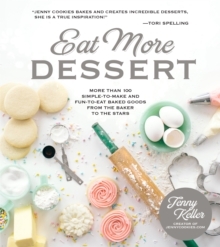 Jenny has created tasty treats for celebrities such as Tori Spelling, Dean McDermott and Tiffani Thiessen and her desserts have been featured on popular shows such as E! News, Extra, Entertainment Tonight, The Insider and in Brides Magazine. Recipes range from simple, crowd-pleasing sugar cookies and mini apple pies, to show-stopping, over-the-top white chocolate-dipped sparkle cake pops and pink drizzled peanut butter cracker cookies. With the exceptional treats from this dazzling dessert guide you'll be the hit of any occasion.